I am delighted to meet you at the opening of the Fifth Ministerial Conference of the Forum on China-Africa Cooperation (FOCAC) in Beijing, as we are gathered here both to renew the friendship between the Chinese and African peoples and discuss ways to boost China-Africa friendship and all-round cooperation. On behalf of the Chinese government and people and in my own name, I wish to extend a very warm welcome to all the distinguished guests coming from afar. I also wish to take this opportunity to convey through you the cordial greetings and best wishes of the Chinese people to the brotherly African people! In October 2000, FOCAC was set up in response to the call of the times. This initiative demonstrates the shared desire of the Chinese and African people to seek peace, cooperation and development in a changing world. In the past 12 years since its founding, the FOCAC member states, maintaining unity and working together, have made important progress in strengthening this mechanism of cooperation. The theme of the current Ministerial Conference is "build on past achievements and open up new prospects for the new type of China-Africa strategic partnership." China and Africa should, with both current and long-term needs in mind, redouble efforts to draw up a blueprint for promoting our cooperation in the next stage and lay a solid foundation for making new and greater progress in growing China-Africa relations in the years ahead. When we met here six years ago at the FOCAC Beijing Summit, China and Africa decided to establish a new type of strategic partnership. Since then, important progress has been made in realizing this vision thanks to the joint efforts of both sides. China and Africa have enhanced all-round friendly political relations featuring mutual respect and mutual trust. We have conducted more frequent high-level exchange of visits and more in-depth dialogue and exchanges, and provided stronger support to each other. China's relations with all African countries, the African Union (AU) and other regional organizations have grown in strength. China has formed strategic partnerships and launched strategic dialogue mechanisms with many African countries. And China has supported African countries in independently resolving hotspot issues in the region and advancing the process of African integration. China and Africa have deepened practical economic cooperation featuring mutual benefit. We have joined hands to fight the international financial crisis, effectively implemented the eight measures for practical cooperation announced at the Beijing Summit and eight additional measures announced at the Fourth Ministerial Conference, and made steady progress in building a framework of all-round cooperation. China's trade with and investment in Africa have been expanding. In 2011, our two-way trade reached 166.3 billion U.S. dollars, three times the figure in 2006. Cumulative Chinese direct investment in Africa has exceeded 15 billion U.S. dollars, with investment projects covering 50 countries. The AU Conference Center and Office Complex built by China was handed over to the African side. China's assistance to Africa has been growing steadily. China has built over 100 schools, 30 hospitals, 30 anti-malaria centers and 20 agricultural technology demonstration centers in Africa. It has met the pledge of providing 15 billion U.S. dollars of lending of a preferential nature to Africa. China and Africa have conducted increasing people-to-people and cultural exchanges featuring mutual learning. A number of activities have been carried out, including the Chinese/African Cultures in Focus, Joint Research and Exchange Plan, Think Tanks Forum, People's Forum and Young Leaders Forum. China has trained close to 40,000 African personnel in various sectors and provided over 20,000 government scholarships to African countries. China and Africa have set up 29 Confucius Institutes or Classrooms in 22 African countries. Twenty pairs of leading Chinese and African universities have entered into cooperation under the 20+20 Cooperation Plan for Chinese and African Institutions of Higher Education. China and African have enjoyed closer ties of solidarity and coordination featuring mutual help and mutual support in international affairs. Our two sides have worked closely on UN reform, countering climate change, sustainable development, WTO Doha Round negotiations and other major issues. In so doing, we have upheld the common interests of developing countries, promoted democracy in international relations, and we are working to make the international order more just and equitable. Facts have shown that the new type of China-Africa strategic partnership is the result of continuous growth of the traditional friendship between the two sides. It meets the fundamental interests of China and Africa and conforms to the global trend of peace, development and cooperation. The forging of this partnership has inaugurated a new historical process in growing China-Africa relations and added new momentum to China-Africa exchanges and cooperation. I am confident that, with our joint efforts, the new type of China-Africa strategic partnership will embrace an even brighter future. Tremendous changes have taken place in the world since we met here six years ago. Peace, development and cooperation remain the trend of our times. On the other hand, uncertainties and destabilizing factors in international developments have notably increased. The impact of the international financial crisis is still with us. Regional and international hotspot issues keep emerging. The unjust and inequitable international political and economic order still affects and hinders world peace and development. Developing countries have maintained strong momentum of growth, but they are also confronted with many difficulties and challenges. In recent years, the African countries and people, working with perseverance and vision, have made remarkable achievements in promoting Africa's peace and development. But Africa still faces major challenges in its development endeavor. The international community should continue to give high priority to enhancing peace and development in Africa and increase input in this area. It should respect Africa's wish, listen to its views, address its concerns and help it meet the Millennium Development Goals at an early date. China is the world's largest developing country, and Africa is home to the largest number of developing countries in the world. China and Africa, together with over one third of the world's population, are an important force for advancing world peace and development. China and Africa share a common destiny, and China-Africa friendship is cherished by the Chinese and African peoples. The Chinese and African peoples have always treated each other as equals and with sincerity and friendship, extended mutual support and pursued common development. No matter how the international landscape may change, China will remain unchanged in its commitment to supporting Africa's peace, stability, development and unity. We will give genuine support to African countries' independent choice of development paths and genuinely help African countries strengthen capacity for self development. We will continue to stand firm with the African people and forever be a good friend, good partner and good brother of the African people. In a world of profound changes, the Chinese and African peoples have high hopes for the growth of China-Africa relations. This means that we should, with a keen sense of responsibility and mission, adapt to new developments, set new goals, take new measures, and solve new problems so as to open up new prospects in building a new type of China-Africa strategic partnership. -- To open up new prospects for a new type of China-Africa strategic partnership, China and Africa should strengthen political mutual trust. We should carry forward our traditional friendship, maintain the momentum of high-level exchanges, enhance strategic dialogue, increase experience sharing on governance, do away with external interference, and deepen mutual understanding and trust. China will, together with the international community, staunchly support African countries in upholding peace and stability and seeking strength through unity. 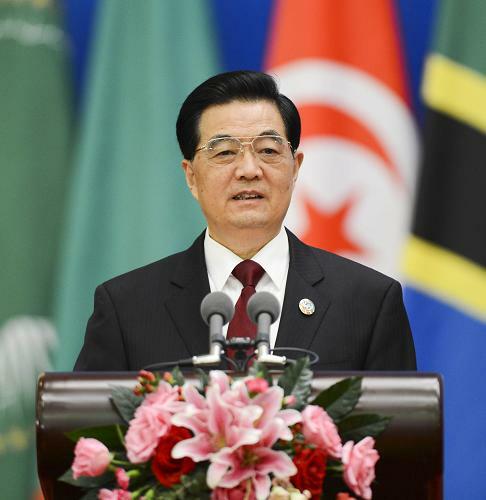 China will play a positive and constructive role in African affairs. -- To open up new prospects for a new type of China-Africa strategic partnership, China and Africa should expand practical cooperation. We should expand areas and explore new ways of cooperation. We should do more to conduct cooperation in agriculture, manufacturing, infrastructure and other priority development areas in Africa. We should work harder to carry out advanced cooperation in investment, finance, services and technology transfer and improve trade mix and upgrade trade. And we should redouble efforts to help African countries enhance capacity for self development. Our goal is for China-Africa cooperation to benefit more of our peoples. -- To open up new prospects for a new type of China-Africa strategic partnership, China and Africa should increase cultural and people-to-people exchanges. We should encourage exchanges and interactions between our two great civilizations at various levels and in various ways, strengthen exchanges in education, culture, science and technology, health, sports and tourism, and increase contacts between youth, women, people's organizations, media and academic institutions of the two sides. In this way, we will provide intellectual inspiration and cultural support for China-Africa cooperation and win even greater popular support for China-Africa friendship. -- To open up new prospects for a new type of China-Africa strategic partnership, China and Africa should increase coordination and cooperation in international affairs. We should jointly uphold the purposes and principles of the Charter of the United Nations, and promote democracy in international relations and harmonious and balanced global development. We should oppose the practices of the big bullying the small, the strong domineering over the weak, and the rich oppressing the poor. We should step up consultation and coordination, accommodate each other's concerns, and work together to meet global challenges on climate change, food security and sustainable development. -- To open up new prospects for a new type of China-Africa strategic partnership, China and Africa should make FOCAC stronger. We should, in light of the latest international developments and new progress in the growth of China-Africa relations, develop new thinking and new forms of cooperation to enhance FOCAC. We should motivate FOCAC members and fully tap their enthusiasm and creativity so as to enhance the cohesion and influence of FOCAC, and make it a more effective platform for cooperation. In the past six decades and more since the founding of the People's Republic of China, and particularly since the reform and opening-up program was launched over 30 years ago, China has made remarkable achievements in its economic and social development. We will always remember and we are grateful from the bottom of our heart for the vigorous support and help the African countries and people have given to our development effort. While the way ahead will not be a smooth one for us, we have full confidence in China's future development. China will stay committed to peaceful development. At the same time, we will endeavor to uphold world peace and promote common development. In the next three years, the Chinese government will take measures in the following five priority areas to support the cause of peace and development in Africa and boost a new type of China-Africa strategic partnership. First, we will expand cooperation in investment and financing to support sustainable development in Africa. China will provide 20 billion dollars of credit line to African countries to assist them in developing infrastructure, agriculture, manufacturing and small and medium-sized enterprises. Second, we will continue to increase assistance to Africa to bring the benefits of development to the African people. China will build more agricultural technology demonstration centers as necessary to help African countries increase production capacity. China will implement the "African Talents Program" to train 30,000 personnel in various sectors for Africa, offer 18,000 government scholarships, and build cultural and vocational skills training facilities in African countries. China will deepen medical and health cooperation with Africa, send 1,500 medical personnel to Africa, and continue to carry out the "Brightness Action" activities in Africa to provide free treatment for cataract patients. China will help African countries enhance capacity building in meteorological infrastructure and forest protection and management. China will continue to carry out well-drilling and water supply projects in Africa to provide safe drinking water for the African people. Third, we will support the African integration process and help Africa enhance capacity for overall development. China will establish a partnership with Africa on transnational and trans-regional infrastructural development, support related project planning and feasibility studies and encourage established Chinese companies and financial institutions to take part in transnational and trans-regional infrastructural development in Africa. China will help African countries upgrade customs and commodity inspection facilities to promote intra-regional trade facilitation. Fourth, we will enhance people-to-people friendship to lay a solid foundation of public support for enhancing China-Africa common development. China proposes to carry out "China-Africa people-to-people friendship action" to support and promote exchanges and cooperation between people's organizations, women and youth of the two sides. China proposes to set up a "China-Africa Press Exchange Center" in China to encourage exchanges and visits between Chinese and African media, and China supports exchange of correspondents by media organizations of the two sides. China will continue to implement the China-Africa Joint Research and Exchange Plan to sponsor 100 programs for research, exchange and cooperation by academic institutions and scholars of the two sides. Fifth, we should promote peace and stability in Africa and create a secure environment for Africa's development. China will launch the "Initiative on China-Africa Cooperative Partnership for Peace and Security," deepen cooperation with the AU and African countries in peace and security in Africa, provide financial support for the AU peace-keeping missions in Africa and the development of the African Standby Force, and train more officials in peace and security affairs and peace-keepers for the AU. To open up new prospects for a new type of China-Africa strategic partnership and jointly build a harmonious world of durable peace and common prosperity is our shared goal and responsibility. Let us join hands and work for a bright future for us all. In conclusion, I wish the Fifth FOCAC Ministerial Conference every success!